Generally, the Trump administration&apos;s approach to agencies that inconvenience its corporate benefactors has been to sabotage them &dash; specifically, by delivering said bureaucracies into the arms of their enemies. Thus, Big Energy&apos;s favorite attorney general is now our nation&apos;s head of environmental protection; a lawyer who made millions representing banks and hedge funds is in charge of regulating the securities trade; and a skeptic of "government schools" is overseeing our government&apos;s schools. And yet, the CFPB has remained under progressive leadership for the duration of the Trump presidency &dash; afflicting our nation&apos;s hard-working fraudulent debt collectors and usurious payday lenders in the process. Trump&apos;s failure to fill the swamp at the consumer bureau is a product of the agency&apos;s design: To insulate the CFPB from presidential meddling, its directors serve five-year terms and can only be fired for cause. Technically, Trump could have fired the agency&apos;s first-ever director Richard Cordray before his term expired in July of next year &dash; but doing so would have triggered a loud, legal battle, thereby forcing the populist president to publicly defend cracking down on an agency that cracks down on abusive banks. The administration has little interest in spotlighting its hostility to consumer-interest financial regulations; it would much rather kill them softly. But when Cordray announced last week that he would be vacating his post early, it looked like Trump would be free to do just that: The Federal Vacancies Reform Act empowers the president to fill an open executive agency leadership position with any member of his administration (who has already been confirmed by the Senate) for up to 210 days. After that, the Senate needs to confirm a permanent replace for said position. The Trump White House (reportedly) intends to use this law to make budget director Mick Mulvaney the CFPB&apos;s interim head. 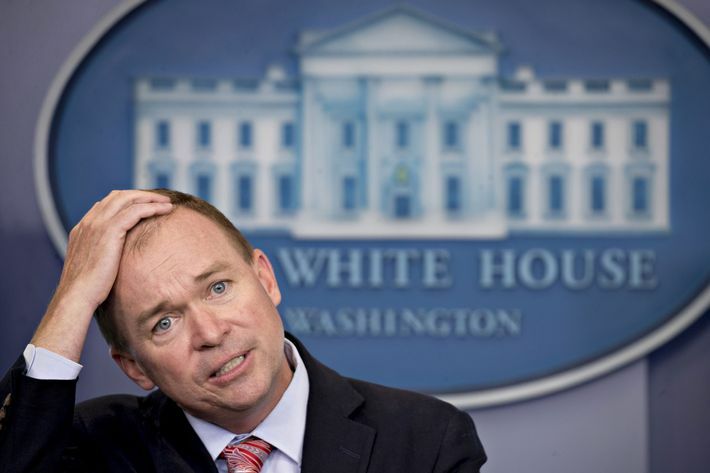 Under this plan, Mulvaney would remain budget director and delegate much of the responsibility for running (i.e., neutering) the agency to someone who shares his belief that the consumer bureau is a "sick, sad joke." This would allow the administration to immediately let abusive lenders go wild, without worrying about winning 51 votes for a Wall Street crony in the Senate any time soon. But Trump&apos;s plan has one, small hitch &dash; it appears to be illegal. The Federal Vacancies Reform Act stipulates that the law does not apply to agencies where "a statutory provision … designates an officer or employee to perform the functions and duties of a specified office temporarily in an acting capacity. "And the Dodd-Frank law that created the CFPB stipulates that the bureau&apos;s deputy director "shall serve as acting Director in the absence or unavailability of the director." What&apos;s more, the House version of Dodd-Frank said that the Federal Vacancies Reform Act did apply to the CFPB &dash; but this language was stripped out in conference committee, a sign that Congress actively decided to mandate different rules of succession for the bureau. Thus, according to Adam Levitin, a Georgetown Law professor, the CFPB&apos;s acting deputy director David Silberman would assume legal control of the agency, once Cordray officially steps down. Silberman is a former labor lawyer who has worked at the CFPB since its inception. So: not the kind of leader Trump is looking for. A spokesman for Chuck Schumer told the Intercept this week that the Senate Minority Leader&apos;s office has "been in conversations with the offices of Sens. Brown and Warren on exploring ways to ensure the line of succession, as drawn up in law, is adhered to." As David Dayen explains, it&apos;s far from certain that the Trump administration will acquiesce to Schumer&apos;s interpretation of the law &dash; and chaos could ensue. THERE&apos;S NO GUARANTEE, however, that Trump would allow Silberman to become interim director. He may try to appoint Mulvaney anyway. At this point, you would have two interim directors of the CFPB, with unpredictable outcomes. Under the law, any action taken by a director that was improperly appointed would have "no force or effect." But someone with standing would have to sue to block those actions. "Someone who is directly regulated by a rule could challenge it," said [Michigan Law School professor Nina] Mendelson. "This could include consumers, but they would have to show they were directly and concretely affected." In the meantime, if Silberman stayed in place and Mulvaney also tried to use the director&apos;s authority, it&apos;s completely unclear who would be listened to. If the Federal Register received a change to a regulation from Mulvaney, would they enact it? If Silberman tried to internally direct an enforcement action, would his colleagues abide by it? It&apos;s possible that Cordray will allow Trump to avoid this headache. The director of the CFPB can appoint the agency&apos;s deputy director without Senate confirmation. But Cordray hasn&apos;t ever officially named Silberman deputy director &dash; his official title right now is "acting deputy director." This means that the position is technically vacant. And there appears to be no legal obstacle to Trump using the federal vacancies law to appoint an interim CFPB deputy director. Still, all Cordray has to do to foreclose this possibility is change Silberman&apos;s title on his way out. Regardless, Trump will, eventually, get the Senate to confirm a corporate crony to lead the consumer watchdog (outgoing Alabama senator Luther Strange is an early favorite). But assuming Cordray leaves the reins in Silberman&apos;s hands, the administration won&apos;t be able to avoid a public fight over its politically toxic priorities for financial regulation.